(a) Using a dial indicator, measure the thrust clearance while moving the connecting rod back and forth. If the thrust clearance is greater than the maximum, replace the connecting rod assembly(s). If necessary, replace the crankshaft. HINT: The connecting rod cap bolts are tightened in 2 progressive steps. (a) Check that the matchmarks on the connecting rod and cap are aligned to ensure the correct reassembly. HINT: The matchmarks on the connecting rods and caps are for ensuring the correct reassembly. (b) Using a 12 mm socket wrench, remove the 2 connecting rod cap bolts. 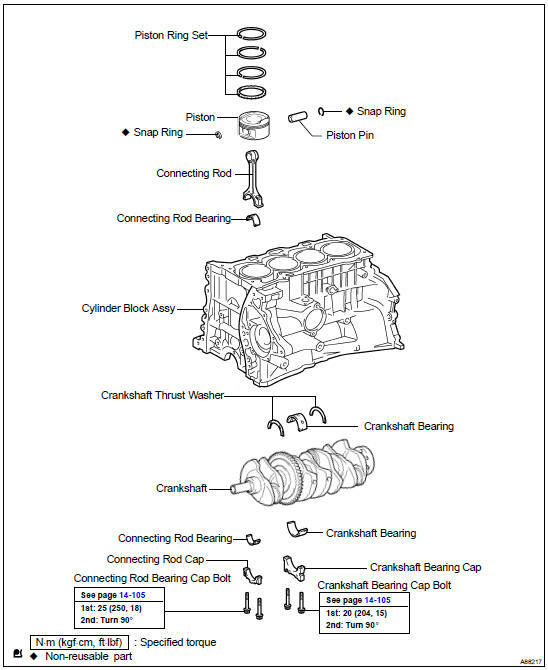 (c) Using the 2 removed connecting rod cap bolts, remove the connecting rod cap and lower bearing by wiggling the connecting rod cap right and left. HINT: Keep the lower bearing inserted to the connecting rod cap. (d) Clean the crank pin and bearing. (e) Check the crank pin and bearing for pitting and scratches. (f) Lay a strip of Plastigage on the crank pin. g) Check that the front mark of the connecting rod cap is facing in the correct direction. (h) Apply a light coat of engine oil on the threads and under the heads of the connecting rod cap bolts. (i) Install the connecting cap (see step 37). NOTICE: Do not turn the crankshaft. (j) Remove the 2 bolts and connecting rod cap. (k) Measure the Plastigage at its widest point. If the crank pin or bearing is damaged, replace the bearings. If necessary, replace the crankshaft. HINT: If replacing a bearing, replace it with one that has the same number as the connecting rod. There are 3 sizes of standard bearings: 1, 2 and 3. (l) Completely remove the Plastigage. (a) Using a ridge reamer, remove all the carbon from the top of the cylinder. (b) Push the piston, connecting rod assembly and upper bearing through the top of the cylinder block. HINT: Keep the bearing, connecting rod and cap together. (a) Using a piston ring expander, remove the 2 compression rings. (b) Remove the 2 side rails and oil ring by hand. (a) Using a small screwdriver, pry out the 2 snap rings. (a) Gradually heat the piston to approximately 80 to 90 C (176 to 194 F). (b) Using a plastic-faced hammer and brass bar, lightly tap out the piston pin and remove the connecting rod. The piston and pin are a matched set. Arrange the pistons, pins, rings, connecting rods and bearings in the correct order. 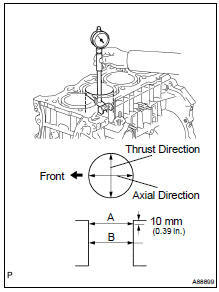 (a) Using a dial indicator, measure the thrust clearance while prying the crankshaft back and forth with a screwdriver. If the thrust clearance is greater than the maximum, replace the thrust washers as a set. (a) Uniformly loosen and remove the 10 main bearing cap bolts, in the sequence shown in the illustration. (b) Use 2 removed main bearing cap bolts to remove the 5 main bearing caps and 5 lower bearings. NOTICE: Insert the bolts into one of the caps. Ease the cap out by gently pulling up and applying force toward the front and back side of the cylinder block, as shown in the illustration. Take care not to damage the contact surfaces of the cap and cylinder block. Keep the lower bearing and main bearing cap together. Arrange the main bearing caps in correct order. (c) Lift out the crankshaft. HINT: Keep the upper bearings together with the cylinder block. (d) Clean each main journal and bearing. (e) Check each main journal and bearing for pitting and scratches. If the journal or bearing is damaged, replace the bearings. If necessary, replace the crankshaft. (f) Place the crankshaft on the cylinder block. (g) Lay a strip of Plastigage across each journal. (h) Install the main bearing caps (see step 36). NOTICE: Do not turn the crankshaft. (i) Remove the main bearing cap (see steps (a) to (b) above). (j) Measure the Plastigage at its widest point. If the oil clearance is greater than the maximum, replace the bearings. If necessary, replace the crankshaft. (k) If using a standard bearing, replace it with one having the same number. If the number of the bearing cannot be determined, select the correct bearing by adding together the numbers imprinted on the cylinder block and crankshaft, and then select the bearing according to the chart below. There are 4 sizes of standard bearings: 1, 2, 3, and 4. (a) Lift out the crankshaft. (b) Remove the 5 upper main bearings and 2 thrust washers from the cylinder block. HINT: Arrange the main bearings and thrust washers in the correct order. HINT: Arrange the bearings in the correct order. NOTICE: If the cylinder is washed at high temperatures, the cylinder liner sticks out beyond the cylinder block. Always wash the cylinder block at a temperature of 45 C (113 F) or less. (a) Using a precision straight edge and feeler gauge, measure the surface contacting the cylinder head gasket for warpage. If the warpage is greater than the maximum, replace the cylinder block. 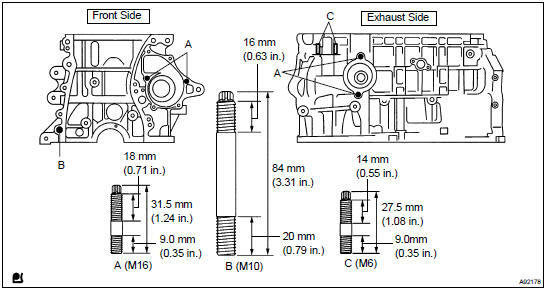 (a) Using a cylinder gauge, measure the cylinder bore diameter at positions A and B in the thrust and axial directions. If the measured diameters is greater than the standard, replace the cylinder block. (a) Using a micrometer, measure the piston diameter at right angles to the piston pin center line, 30.3 mm (1.193 in.) from the piston head. (a) Subtract the piston diameter measurement from the cylinder bore diameter measurement. If the clearance is greater than the maximum, replace all the 4 pistons. If necessary, replace the cylinder block. (a) Using a feeler gauge, measure the clearance between the piston ring and the wall of the ring groove. If the clearance is not as specified, replace the piston. (a) Using a piston, push the piston ring a little beyond the bottom of the ring travel, 110 mm (4.33 in.) from the top of the cylinder block. (b) Using a feeler gauge, measure the end gap. If the end gap is greater than the maximum, replace the piston ring. If the end gap is greater than the maximum even with a new piston ring, replace the cylinder block. (a) Using a caliper gauge, measure the inside diameter of the piston bushing. (c) Using a caliper gauge, measure the inside diameter of the connecting rod bush. (d) Subtract the piston pin diameter measurement from the piton pin bush hole diameter measurement. If the oil clearance is greater than maximum, replace the connecting rod. If necessary, replace the piston and piston pin as a set. If the oil clearance is greater than the maximum, replace the connecting rod. If necessary, replace the piston and piston pin as a set. If the oil clearance is greater than the maximum, replace the connecting rod. If necessary, replace the connecting rod and piston pin as a set. If the out-of-alignment is greater than the maximum, replace the connecting rod assembly. If the twist is greater than the maximum, replace the connecting rod assembly. (a) Using a dial indicator and V-blocks, measure the circle runout, as shown in the illustration. (b) Using a micrometer, measure the diameter of each main journal. If the diameter is not as specified, check the oil clearance (see step 26). If necessary, replace the crankshaft. (c) Check each main journal for taper and out-of-round as shown in the illustration. If the taper and out-of-round is greater than the maximum, replace the crankshaft. (d) Using a micrometer, measure the diameter of each crank pin. If the diameter is not as specified, check the oil clearance (see step 2). If necessary, replace the crankshaft. 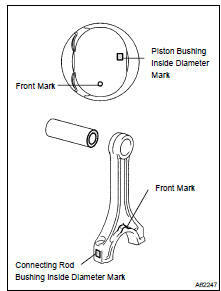 (e) Check each crank pin for taper and out-of-round as shown in the illustration. (a) Using a vernier caliper, measure the tension portion diameter of the bolt. (a) Using a plastic-faced hammer, tap into the ring pin. (a) Apply adhesive around the tight plugs. Adhesive: Part No. 08833-00070, THREE BOND 1324 or equivalent. (b) Using SST, install new tight plugs as shown in the illustration. (a) Install the stud bolts as shown in the illustration. (a) Using a plastic-faced hammer, tap into the straight pin. (a) Using a small screwdriver, install a new snap ring at one end of the piston pin hole. (b) Gradually heat the piston to approximately 80 to 90 C (176 to 194 F). (c) Align the front marks of the piston and connecting rod, and push in the piston with your thumb. (d) Using a small screwdriver, install a new snap ring on the other end of the piston pin hole. (a) Install the oil ring expander and 2 side rails by hand. 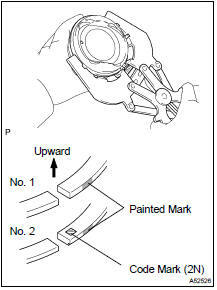 (b) Using a piston ring expander, install the 2 compression rings with the painted mark as shown in the illustration. NOTICE: Install the compression ring No. 2 with the code mark (2N) facing upward. (c) Position the piston rings so that the ring ends are as shown in the illustration. (a) Install the upper bearing with an oil groove on the cylinder block. NOTICE: Clean the contact surfaces of the bearing and the cylinder block. The surfaces should be free of dust and oils. (a) Install the lower bearing on bearing cap. NOTICE: Clean the contact surfaces of the bearing and the bearing cap. The surfaces should be free of dust and oils. (a) Install the 2 thrust washers under the No. 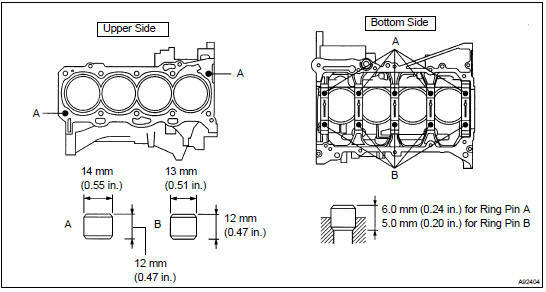 3 journal position of the cylinder block with the oil grooves facing outward. (a) Apply engine oil to upper bearing and install the crankshaft on the cylinder block. 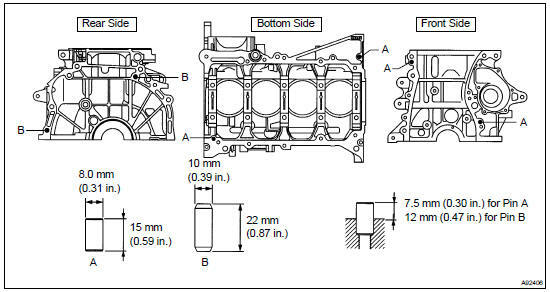 (b) Examine the front marks and numbers and install the bearing caps on the cylinder block. (c) Apply a light coat of engine oil on the threads and under the head of bearing cap bolts. (d) Install and uniformly tighten 10 main bearing cap bolts in several passes,in the sequence shown. (e) Mark the front side of the bearing cap bolts with paint. (f) Retighten the bearing cap bolts 90 in the sequence shown. (g) Check that the painted mark is now at a 90 angle to the front. (h) Check that the crankshaft turns smoothly. (a) Align the bearing claw with the groove of the connecting rod or connecting cap. NOTICE: Clean the backside of the bearing and the bearing surface of the connecting rod. The surface should be free of dust and oil. NOTICE: The connecting rod cap bolts are tightened in 2 progressive steps. (a) Apply engine oil to the cylinder walls, the pistons, and the surfaces of connecting rod bearings. 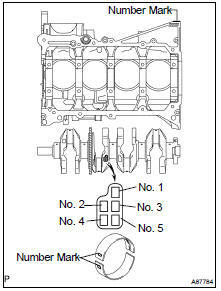 (b) Check the position of the piston ring ends. (c) Using a piston ring compressor, push the correctly numbered piston and connecting rod assemblies into each cylinder with the front mark of the piston facing forward. NOTICE: Match the numbered connecting rod cap with the connecting rod. (d) Check that the protrusion of the connecting rod cap is facing in the correct direction. (e) Apply a light coat of engine oil on the threads and under the heads of the connecting rod cap bolts. (f) Using a 12 mm socket wrench, uniformly tighten the 2 bolts. Torque: 25 NVm (255 kgfVcm, 18 ftVlbf) (g) Mark the front of the connecting cap bolts with paint. (h) Retighten the cap bolts 90 as shown in the illustration. (i) Check that the crankshaft turns smoothly.